Tiger Balm Neck And Shoulder Rub Boost (Extra Strength) provides faster and more effective relief for minor aches and muscle pain, stressed muscles, strains, bruises and sprains. "I was introduced to the product in a chinese medical centre in the Maldives and it allowed me to regain movement in my arm and shoulder very quickly saving my holiday from being ruined"
Kaminomoto Medicated Shampoo helps you to maintain a clean and healthy scalp. The medicated shampoo cleans and removes excessive sebum and impurities in the pores of your scalp. "FANTASTIC SERVICE. Super quick delivery and wonderful products. So happy I stumbled across SGBox....wil definitely be shopping there again:-)"
Tiger Balm Back Pain Patch's active ingredients are absorbed quickly into your skin, stimulating blood circulation and providing soothing and long lasting relief to aches and pains on your back. "I purchased the patches for my elderly Aunt who suffers from crushed vertebrae, osteoporosis and muscle pain in her back. 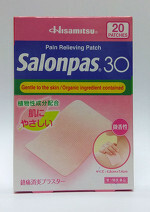 Nothing else has given her any relief until I purchased Tiger Balm Back Pain Patches while on holiday in Singapore. I am therefore very happy that you sell them online. Thank you." Like the original Tiger Balm, Tiger Balm Soft is also known to be highly effective against headaches, muscle aches, strains and sprains and rheumatism. "The package has arrived today. The stock has been delivered 3 days before the minimal expected shipping time! All the items were in perfect status. I'm very satisfied of Your service Best Regards. F. P."
Axe Brand Medicated Oil / Axe Oil is extremely effective in relieving pain and discomfort from colic and stomach ache or swelling, redness and itchiness from insect bites, giddiness and headache, blocked or stuffy nose. "I love this stuff. I use it for muscle aches, headaches, mosquito bites, colds, rashes, etc.. It is wonderful! I cannot say enough good things about it. It is a wonderful pain reliever. Jennifer, USA"
Used regularly, Tiger Balm Joint Rub (With Glucosamine Sulfate And MSM) is highly effective in relieving pain due to muscle sprains, stiffness, backaches and minor pains associated with arthritis. "I live in the state of Illinois in the United States. I received my order of Tiger Balm Joint Rub within 2 weeks. It was well-packed and in excellent condition. This is the only company that offers this product online. We cannot find it anywhere in the U.S. Ordering from them is truly a positive experience. I have no doubt that I will be a repeat customer in the future. The company maintains a high level of quality customer service and communication. I highly recommend this company to everyone. I will certainly recommend it to all my acquaintances. Alison B." White Flower Oil / Embrocation provides quick relief to aches and pains due to arthritis, sprains, bruises, muscle strains, joint pain, back and neck ache, and discomfort due to insect bites, stings, stuffy nose and sinus headaches. "Your products always arrive in prompt fashion; never damaged and secured beyond measure. We use the White Flower Embrocation in our home extensively. My mother has osteoporosis and arthritis in her back. She uses your product daily and it has assisted tremendously in pain control. I use it when the arthritis in my shoulder becomes intolerable. Generally the pain is manageable within 12 hours. We have shared this product with friends and from their results I'm sure they'll be ordering directly from SGBox in short order. Thanks again for excellent service! Beverly"
This is a comprehensive hair loss prevention program that uses a three step approach to quickly and effectively improve the condition of your hair and scalp through the removal of impurities, prevent the formation of dandruff and oily scalp that cause most hair problems and prevent premature hair loss and encourage hair re-growth by maintaining and nourishing your scalp. "Ordered on the 9th(US date) time, and sent out on the 13th(US date) [2 bussiness day] Receive product on 18th, I picked the 7-10days shipping but it arrived in 5 days. -Fast delivery"